Thick porcelain with non slip coating with matte finish. Long slender simply elegant contemporary look for your vanity top. Tumbler: Tall slender design with non slip coating with beautiful white porcelain on the inside. Soap Dispenser: Continuing with the slender elegent look to this design the dispenser has a sturdy shiny chrome pump head. The non slip surface is perfect for the bathroom. Toilet Brush Set: Shiny chrome handle attaches to a smartly designed toilet brush head. The top of the brush is black because it is visible from above. This gives this toilet brush set a much cleaner look after each use. Dark Blue: Deep dark blue. It almost looks black but it is not black. The non slip coating over the porcelain is beautiful. 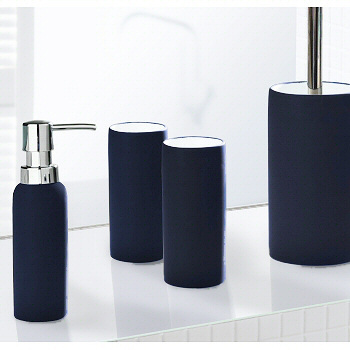 Anthracite Grey: Dark grey tumbler with matching soap dispenser and toilet brush set. Black: The slender design of this bath accessory set is perfect in black. Simply elegant!